I am so excited to start this new part to the site! I love hearing about money saving tips and pretty weddings! 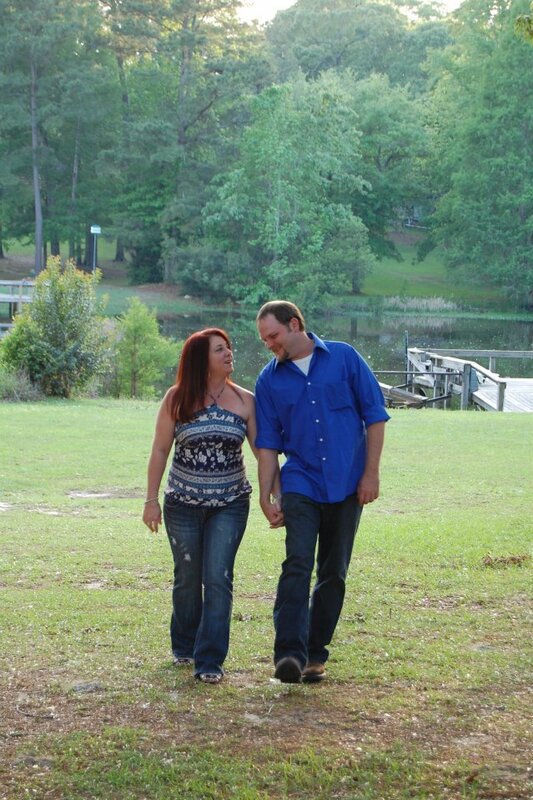 Melissa and David are getting married September 8th, 2012 so her date is coming up quickly! So there are still some things to plan but everything is really starting to pull together. We have a seriously limited budget (nil, well almost nil). We’re having our wedding September 8, 2012 at my parents home. The wedding is in their front yard, and the reception is in their backyard. I’ve got my dress and shoes, got his suit and shoes, but my dress needs to be altered and he needs a tie and vest. Melissa’s colors are black, red and silver! She has really saved money on the dress and shoes (the shoes she already owned!) and the most unique part about the wedding wear is her non-traditional dress color! 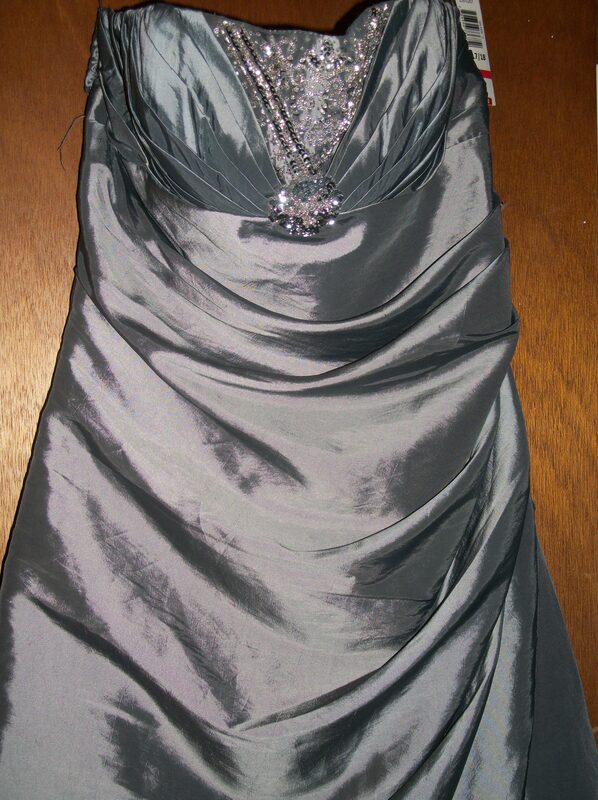 I am wearing the gunmetal grey dress and silver peep-toe pumps…My bridesmaid’s are wearing little black dresses (non-matching) and the MOH is wearing a dark red dress that has a sheer black bodice over it. The groomsmen are wearing black or dark grey suits with some sort of red tie, with white shirts. Her friends and family are really helping to chip in with some of the hefty costs by donating their lawn and their time! One of our friends is paying for a third of the photographer’s cost so we’re going to be able to swing that, and my dad and his family are covering the food for the reception, and my dad will be borrowing chairs, tables, and a few tents for the reception. My aunt is making our cake…[it’s] is going to be a simple 2-tier red velvet cake, and my aunt is also making cupcakes so it will be cheaper. Click for a delicious recipe so you can make one for your wedding too! What a delicious cake it’s going to be too! Red Velvet is my ABSOLUTE favorite! They are having few decorations, but the meaning behind them makes them really significant, as well as being affordable! I’m one flat broke bride, but I’m a happy bride. I know with the help of family and friends we’ll pull it all off, and it will be wonderful, but it’s stressful to say the least, and using all of my creative ability. I love how the family is rallying around the couple to really make their day so special. This is what weddings are really all about. Cut out the flash and panache, and it really comes down to two families coming together to celebrate the love of two people. :::sniff::: I am really hoping our wedding will be full of love just like I know this couple’s will be! Thanks so much for your post on our upcoming wedding. We’re truly excited about the wedding. While visiting my mom Saturday for Mother’s Day I took my dress with me so I could try it on for my mom. She’d only seen pictures of it. She absolutely loves it, and the shoes that match it perfectly. And she loves that I’m going to have it altered to tea-length. My dad and brother have been working on the yard and it looks gorgeous. I could see the sprouts of grass from the grass seeds my brother had put out…the rain they recently had has really helped the grass grow. For Mother’s Day we bought my mom a hydrangea plant that has mauve, purple, and blue blooms so she’s finding a place to plant it. (It should be in bloom when we have the wedding.) I’m on the prowl for a few rose bushes, and my brother is on the hunt for an arbor (or we’ll be making one). Next weekend we’re going to thrift stores to see if we can find some more sheet music and getting the supplies to make our invitations. You are very welcome! I am so glad that things are coming together for you! I love that you planted flowers to bloom in time for the wedding! How perfect! Good luck finding everything you need! You go girl! Featured on “Flat Broke Bride.” WOW! She did such a great job. I absolutely loved her post.